Research on Welsh weavers, and Dendrochronology (wood identification andating). Eureka Looms are now being restored in different places around the country. The one pictured here is in the early stages of restoration. 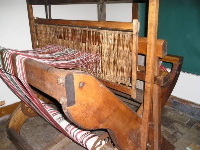 This model was introduced to the market in 1880 by Eureka Fly Shuttle Loom inventor Dr. Kynett. By 1885, he as allowing trade-ins of this model for his newest fly shuttle loom model. 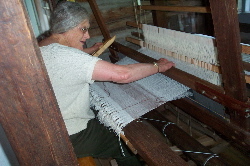 For more on Eureka Looms, see the Rag Rug Handbook. See the Misc. Loom Companies page for available Eureka Loom manuals.